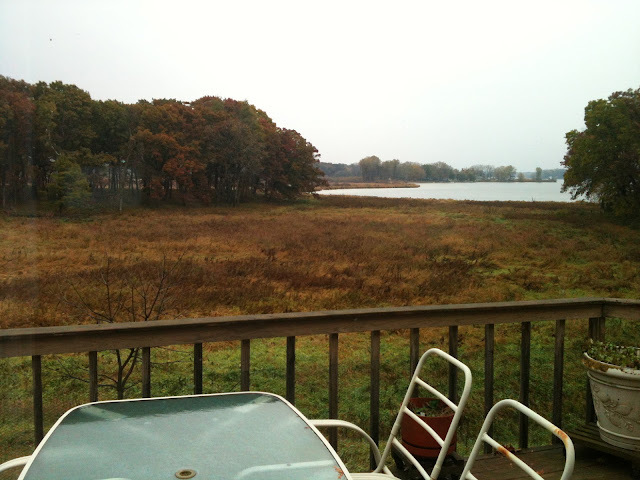 View from the deck at Portage. This weekend was one that I've been looking forward to for quite some time! Chad and I try to get away to Portage as much as I can, but plans happen and life just gets busy! This was the only weekend open where we could break away this fall and we were really wanting to get up north so we could chill, cook, carve some pumpkins and live a little bit simpler for a bit. 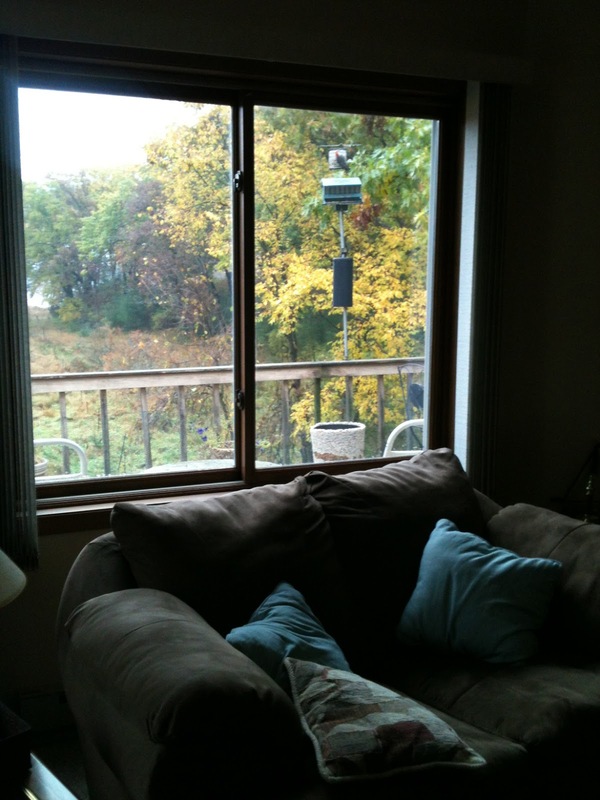 This is my seat of choice: near the fire, view of birds, and nice cozy couch. 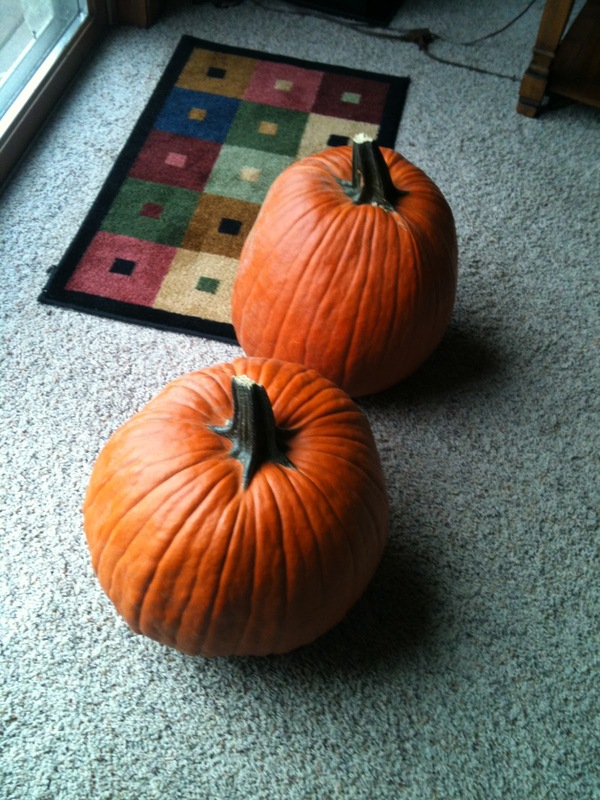 Pumpkins to carve. Sadly, these never got touched, but they sure look festive! Friday after work, we loaded up the car, grabbed tons of groceries from a list that I had prepared the week prior and we set out for an hour up north at a family house that we love to get away to. It didn't go quite as smoothly - we got up there only to realize that I had forgotten the cream cheese. Chad attempted to pick up some from his grocery stop (we went separately - I was in charge of food and he was in charge of drinks) only to leave the 2 boxes at the grocery store - HA! We had to head out for an extra trip, but once we did, we were on lock down and promised to stay in until Sunday. First things first! I start dinner... a frozen pizza (we didn't arrive until a little later thanks to our detour) and Chad began working on getting the fire going.This evening was not so exciting - just what I had hoped for! Portage doesn't have cable, but recently wi-fi was installed so we do have access to Netfix. We try not to watch much tv, but tonight we indulged in a couple of episodes of "Lie to Me," our favorite for the moment. OH! I almost forgot that I whipped up a new recipe for an egg casserole. We substituted spicy sausage instead of bacon. I love preparing breakfast the night before so you don't have to cook right when I get up in the morning! Saturday was when the real action happened! I awoke, of course, at 6:30 am. I was hoping to sleep in more, but got over it quickly since I could start the day watching the birds, listening to the rain, and reading a new book. It was great to take time waking up. I managed to pop the casserole in the oven. Once that was done after an hour I got a chicken roasting. This was majorly easy. Word to the people who have never made a whole chicken? It is not a big deal - you can so do this! 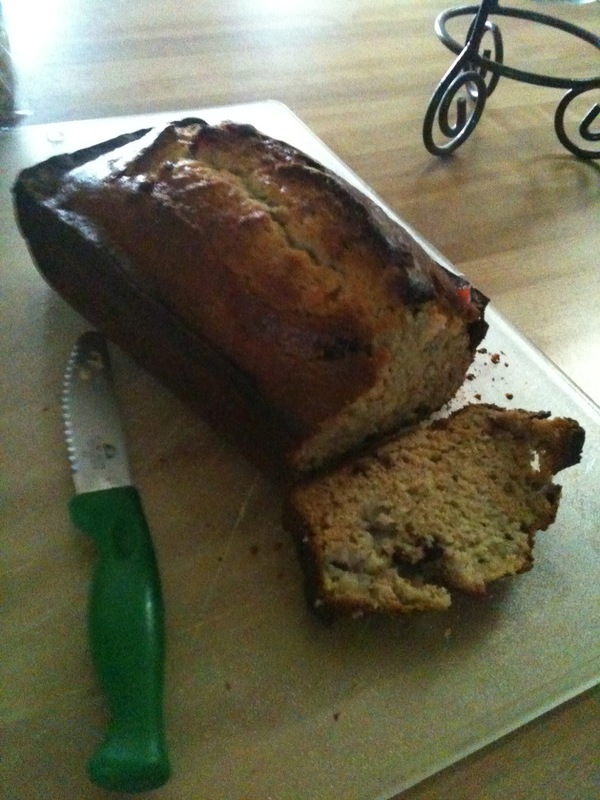 Once the casserole was done, I whipped up some banana bread and baked it while we were eating. All you have to do to roast a chicken is have a roasting pan (check - I don't have one, but there was one at Portage. Note-to-self, add roasting pan to the wedding registry. Oh wait, I have to create a wedding registry! Oh well, no wedding talk this weekend...I'm on vacation!) Alright, back to roasting. So you've got the pan, you're halfway there (no, really!) Now, the most important part.... Remove the Giblets from inside the chicken. You don't do this and you will probably get a horrible smell, or worse - start a fire. Giblets - out! Wash off the chicken and put in the roasting pan, breast side up. Don't be deceived! These are easy to cook - they just take a bit of time. Season with salt and pepper, toss in a 1/2 cup of water the pan, and throw into a 350 degree, pre-heated oven. That's it! The only thing left is how long to cook. The rule is 20 min per pound. 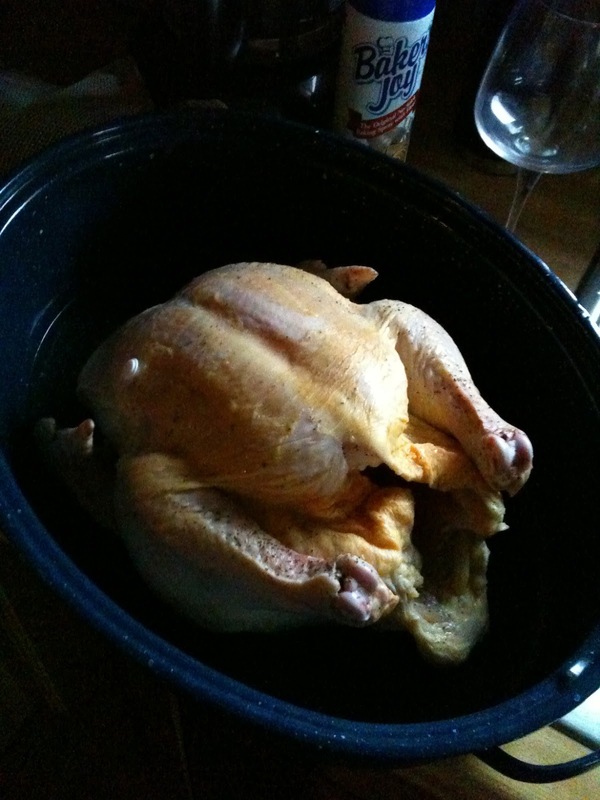 My chicken was a big mother (7.6 lb) so I put it in for 2 hours to be safe. It came with a plug in it, that pops when it's done, meaning it reaches a safe temperature. Mine had popped at 2 hours, but I left it in for another 10, just to be sure and get it a bit more golden. I have to say, this was SO easy! You just need to be home for the 2 hours while it's cooking! And so I leave you with my first few recipes. Many more recipes to come in Part 2 - I promise they won't disappoint!